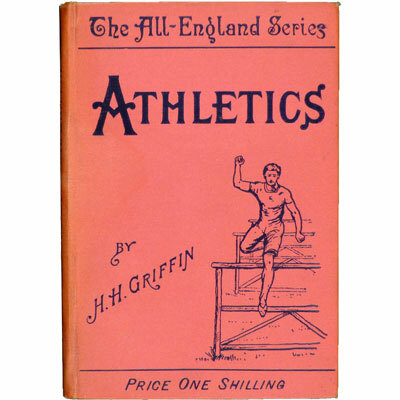 The All-England Series - Athletics - H. Hewitt Griffin 1891 - George Bell & Sons, London - First Edition	A stunning bright near fine copy of a rare work. With contributions by E.H. Pelling (Sprinting); H.C.L. Tindall (Quarter and Half Miles), J.L. Grieg (Long Jump); T. Jennings (High Jump); C.F. Daft (Hurdles or ‘Topping the Timber’); J. Kibblewhite (Mile and Distance Running); Tom Ray (Pole Jump); Sid Thomas (Cross Country); and Rev.W. Pollock-Hill (Middle Distances). Seventeen illustrations and full page plates including plans of sports grounds and fields; A Chronograph for Timing; photographs of events and sketches of athletes in action.